Back in January, I did a quickie review of Noodler's Black Swan in Australian Roses (BSIAR) - I didn't love it. I didn't hate it. A week or so ago, I received a larger sample of it along with a sample of Pilot Iroshizuku Yama-budo. I'd heard so many wonderful things about about Yama-budo that I didn't wait too long to ink my Pelikan M320 and take it for a spin. And because I was inking pens, I inked a Lamy Al-Star with BSIAR and decided to compare and contrast it with Yama-budo. 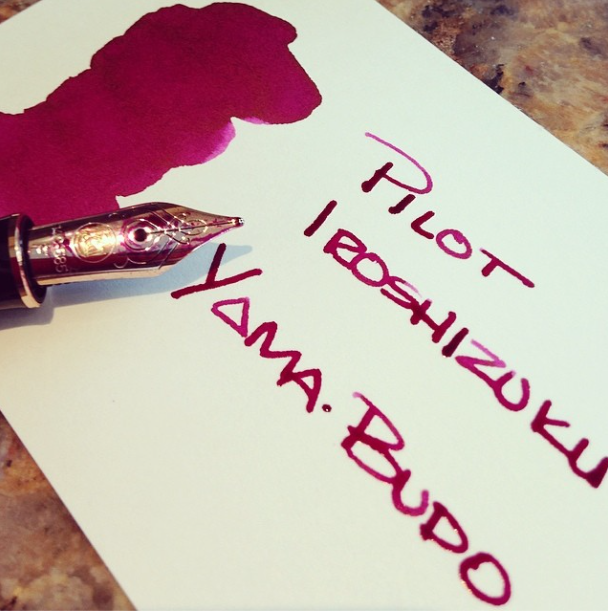 In each of my pairs of writing, Yama-budo will be on top. The color of each reminds me of grapes. I'd originally said that BSIAR was bordeaux in color and my first thought about Yama-budo was that it reminded me of melty grape sorbet. In looking at the colors right next to each other, I'm confident with each of those descriptions. Yama-budo looks fresh and BSIAR has a more aged look to it. Yama-budo is a bit brighter while BSIAR has a little muddiness to its darker color. Shading? 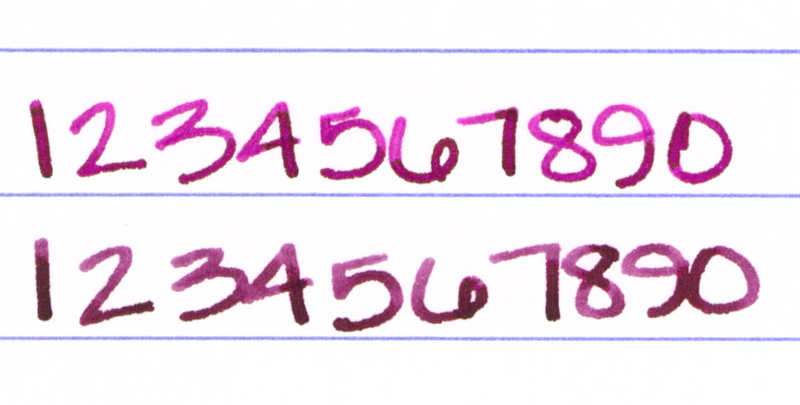 They both shade, but there seems to be more variation with Yama-budo. Yama-budo goes from an almost bright pink to a deeper purple color while BSIAR seems to remain various shades of the same color. 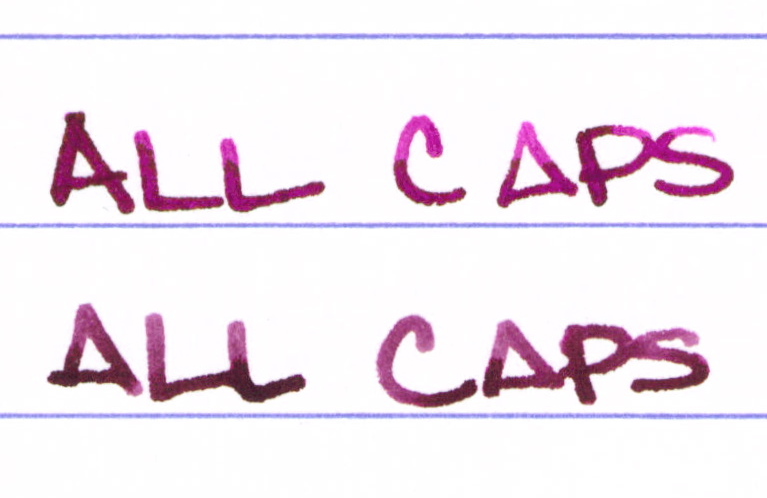 Saturation is about equal (and very good) with both inks. I experienced no trouble writing with either ink. Flow was good, neither was excessively wet nor dry. Each is a good quality ink. There's no feathering, or bleed through with either. Yama-budo did have some ghosting on Clairefontaine paper, but just when dotting the letter i in a couple of places - so minor that I almost didn't mention it. Yama-budo was more likely to smear right out of the gate, but by the time 30 seconds had passed, things were just about even. Again, Yama-budo on top and BSIAR under . . . Here's the entire review sheet . . .
Click Here to see it full size (it's huge). So, what's my bottom line? I've ordered a full-sized bottle of Yama-budo. While the color difference isn't huge, the brightness and amount of shading made all of the difference for me. There are so many ink choices out there that it is the subtle things that make all of the difference between "just ok," and "love it!" What do you think? Black Swan in Australian Roses or Yama-budo? Neither? Both? Great review thanks for that. Based on your past review of BSIAR I bought a bottle and really enjoy it. The IYb has too much pink hue for my tastes. Plus I've just never been able to justify that much money for ink. I bought a bottle in a different color and I like it but not enough to buy more and double the price of the Diamine and Noodlers that serves me so well. It's a good point - the BSIAR is so much less expensive that if the color works for you, there's no reason to spend for the Iroshizuku. 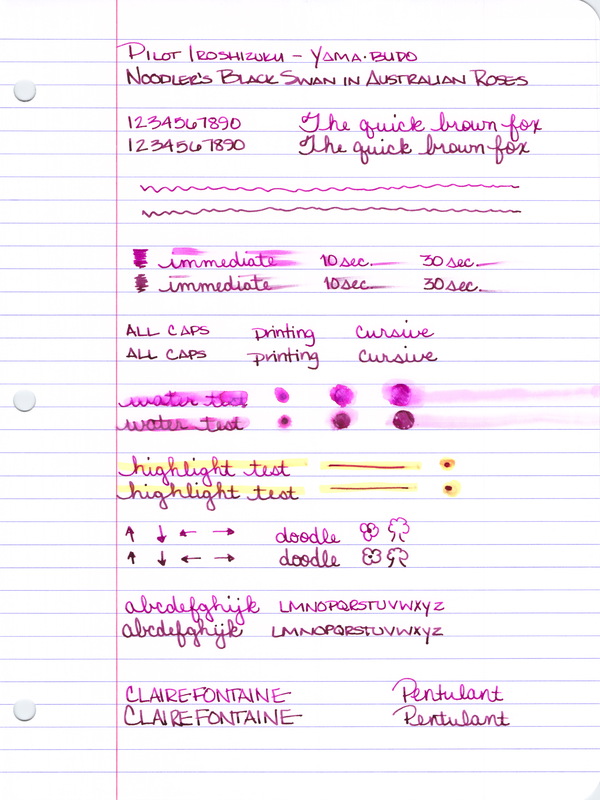 They are each really great inks that worked well in the pens I tested. Glad you're loving Australian Roses! 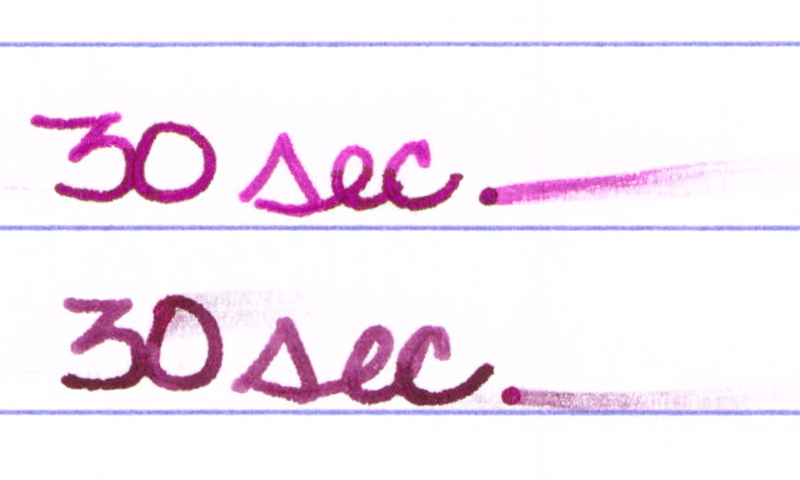 Also worth noting the noodler's bottle is nearly twice the volume. It's 90 or more ml versus 50. I like both though and am happy to have them. Very nice review. Thanks! Oh my gosh, yes! Such a good point. Excellent eye on matching these two colors. Of the two Black Swans I prefer the English Roses. Do you have a similar but lighter shade ink match idea for English Roses?